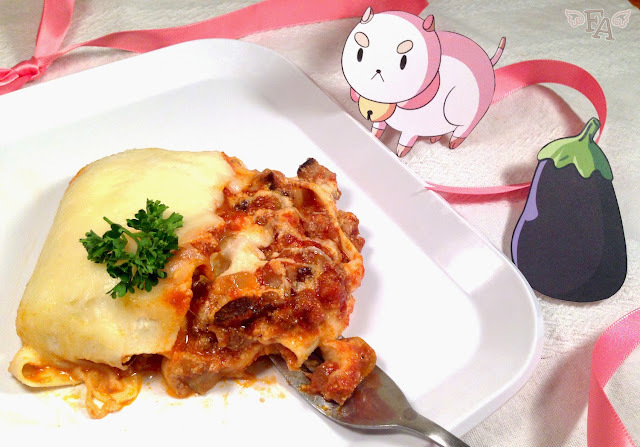 Fiction-Food Café: Eggplant Lasagna for "Bee & Puppycat"
Eggplant Lasagna for "Bee & Puppycat"
I love "Bee & Puppycat" by Natasha Allegri! It tugs at the magical girl genre ("Sailor Moon", anyone?) and the animation style simply feels good to my eyes and heart. There's something calming about. And I can't tell you how many times Smalls and I have have watched the first (and currently only) episode (watch it below). For a 3 yr old to sit still for almost 11 minutes, that's really saying something. 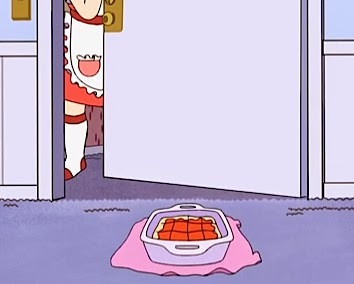 Near the beginning of the episode, Bee's friend Deckard brings her a lasagna casserole as a sympathy gift for her after she lost her job (again). 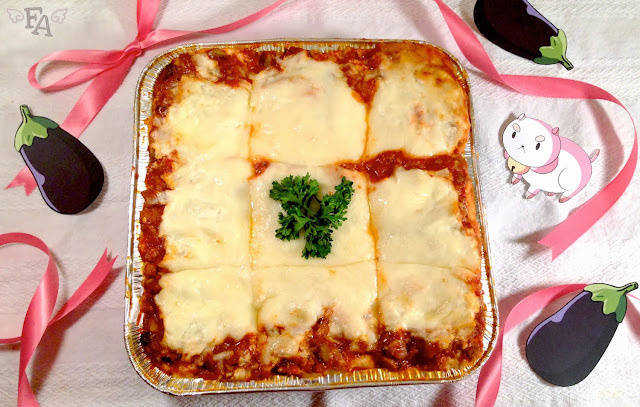 Then, at the end of the episode, Bee decides to repay Deckard's thoughtfulness by giving him a lasagna casserole in return. Perhaps the overt presence of lasagna in the world of "Bee & Puppycat" is from Natasha Allegri's love of Garfield. Also distinct in the episode is the appearance of eggplants. They take the form of pet items and background patterns (see below). As you can imagine, I couldn't resist putting these two foods together. 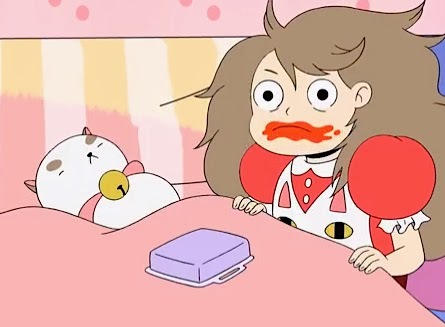 Take a look at the first "Bee & Puppycat" episode below! Feel the random, quirky, intriguing awesomeness. 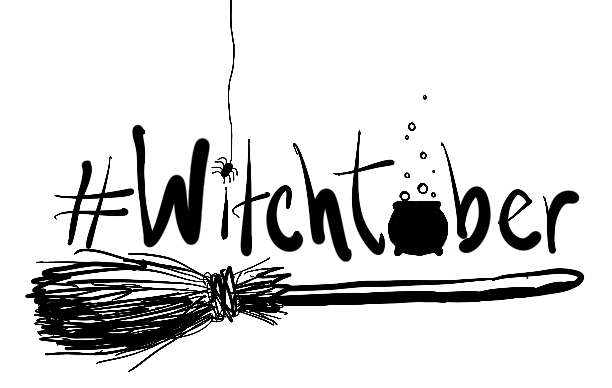 And then check out the "Bee & Puppycat" Kickstarter campaign (ends Nov. 14)! 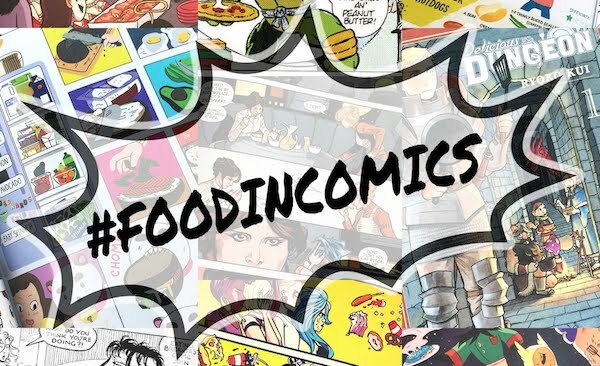 The goal of the campaign is to raise enough money for the production of several more episodes. I so badly hope the project is successful! Please help out if you can. Note: You'll notice that Deckard's lasagna has a red sauce blob on top. I imagine this was done for visual purposes. I mean, a white blob (of mozzarella cheese) on top wouldn't stand out at all and would probably make it difficult to instantly understand that it's lasagna. But in the real world we want cheese on top. Because. Cheese. And, yeah, I know Deckard's lasagna was store bought, and Bee was gonna buy one too, but just imagine if they homemade the lasagnas. They'd probably be yummy like this. 1. Put the eggplant cubes in a colander & rub lightly with salt & then sit the colander in your sink for about an hour (the potential bitterness of the eggplant will drip out as a brown liquid. Blerg). Preheat oven to 400°F. Rinse the cubes under cold water to get off most of the salt. Using your hands & paper towels, squeeze the cubes to drain well & then put them on a foil-lined baking tray. Rub them with a small amount of oil & then bake for about 10 mins, until the cubes are a bit toasty-brown. Remove from oven & decrease the oven temp to 350°F. 2. In a large pan over medium heat, cook the diced onion, minced garlic, chopped mushrooms, & ground beef until the onions are tender & the meat is no longer pink. Make sure you break up the meat clumps into smaller bits as it's cooking. Reduce the heat to simmer & add the eggplant & then stir everything together. Next, stir in 2 1/2 cups of the plain spaghetti sauce & heat everything a few minutes more until it's all warm & combined. Remove from heat. In a medium bowl combine the ricotta with 2 cups of the shredded mozzarella & set aside (it's easy & quick if you use your hands). 3. Spread the remaining 1/2 cup of plain spaghetti sauce in the bottom of your 8"x8" pan & lay 2 of the oven-ready lasagna noodles over the sauce, side-by-side. Next, spread a layer of the ricotta & mozzarella mixture over the noodle sheets. 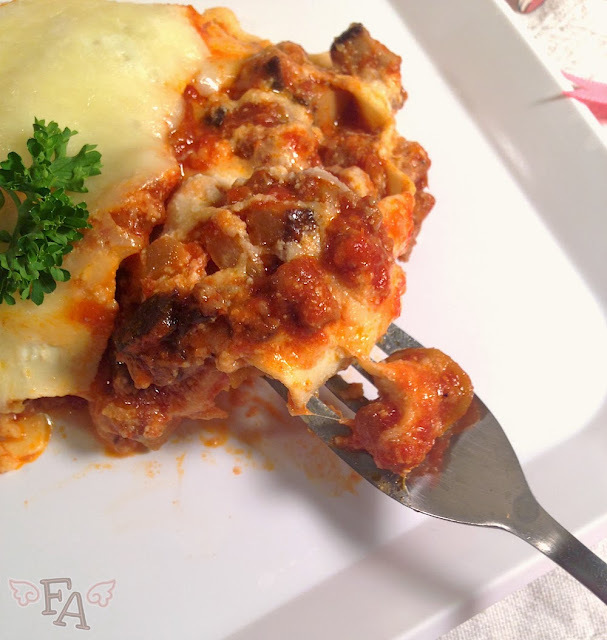 Spoon on some eggplant/meat/sauce mix over the cheese & then lay on 2 more side-by-side noodle sheets. Repeat the layering & then top it all with the remaining cup of shredded mozzarella. All together you'll end up with this: plain sauce - 2 noodles - ricotta/mozz - eggplant/meat/sauce - 2 noodles - ricotta/mozz - eggplant/meat/sauce - 2 noodles - ricotta/mozz - mozz. 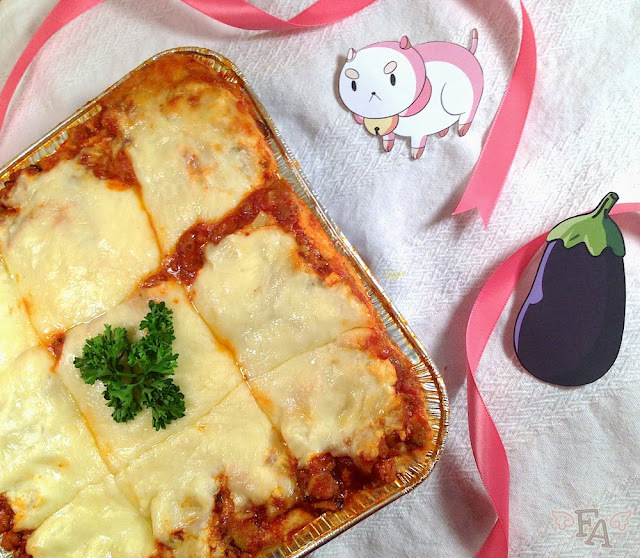 Using the same foil that you used to bake the eggplant cubes, make a tent over the lasagna & bake for 25 mins. Remove the foil & bake for 5 mins or so to slightly brown the top cheese (I could have let mine bake a little longer). Remove the lasagna from the oven & let it cool for a few minutes before serving or delivering to a friend. Fresh parsley makes a nice garnish that compliments the taste really well (& it looks purty). Warning: do not fall asleep while eating this or you may have strange dreams involving dancing & falling adorable cat/puppy creatures. Or do. This looks so amazing! My family went on a trip to Mexico and they're coming back this weekend. I'm definitely going to surprise them with the great recipe. Thanks so much!!! BTW, this cartoon is awesome!!! Thanks for the introduction!!! Ooo! Let me know how it goes! It's definitely a yummy dish. And yes! I love this cartoon, can't wait for more episodes! It was so great!! We ate it last night and everyone loved it. I've been a vegetarian for years now, and my family didn't even mind that I didn't add meat! Thanks, Diana!!! So happy to hear that! Thank you for telling me, Modesto!